Starlight is a beautiful custom 106 foot C. Raymond Hunt designed yacht built by the team at Derecktor Shipyard and Goetz Custom Technologies (Derecktor-Goetz). Using the latest in composite construction technology developed by Eric Goetz, Starlight is more high tech then classic. 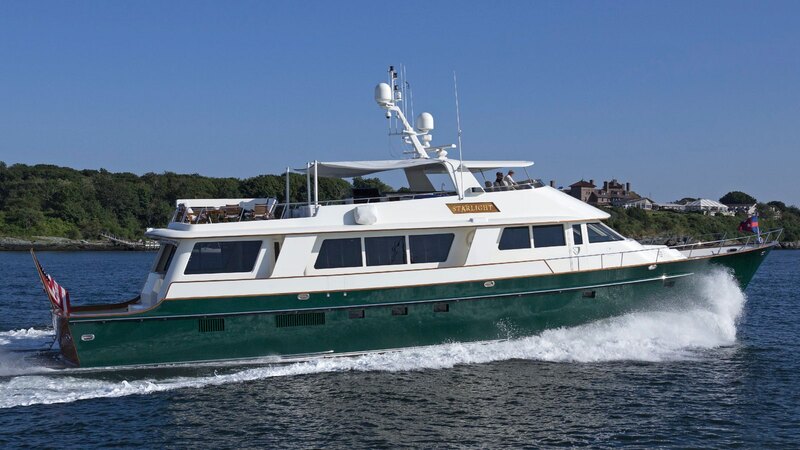 However, she truly looks and feels like a classic yacht with her high gloss transom, expansive teak decks, sweeping walkaround decks, high gloss varnished cap rails, and striking dark green hull. Her spacious layout, true raised panel mahogany interior, and many custom interior details set Starlight apart from all others, making her a one of kind yacht. 2016 33’ Southport center console, 2 x 350 hp Yamaha engines. Tender has a dive door and complete deep sea fishing gear. Inflatable tubing toys and kayak. Starlight accommodates 6 guests in 3 spacious cabins below. The master stateroom is full beam with double sinks and shower/tub. The flexible accommodations feature a queen sized stateroom and a stateroom with two twin beds, perfect for families with kids. The expansive sun deck features a large square dining table surrounded by chairs and bench seating that easily accommodates up to 8 guests. The sun deck also features removable sun shades, comfortable lounge chairs, a BBQ grill, ice maker, wine storage and helm station.